Paul Grogan from CGE (or Czech Games Edition) had a host of Vlaada Chvatl games that everyone was getting all excited about; especially the espionage based party game Codenames, but the game that piqued my interest was Castaways Club. The name is still provisional but the game is a spiritual sequel to Last Will. The Castaways Club will have the players trying to fall from grace in a variety of ways, each game can be different as the system is modular allowing you to swap and change the type of game each time. You may be trying to lose the election, break up all your friends or try and loose all your money and, here’s the best bit, if you already own Last Will you can slot it in as the property module! 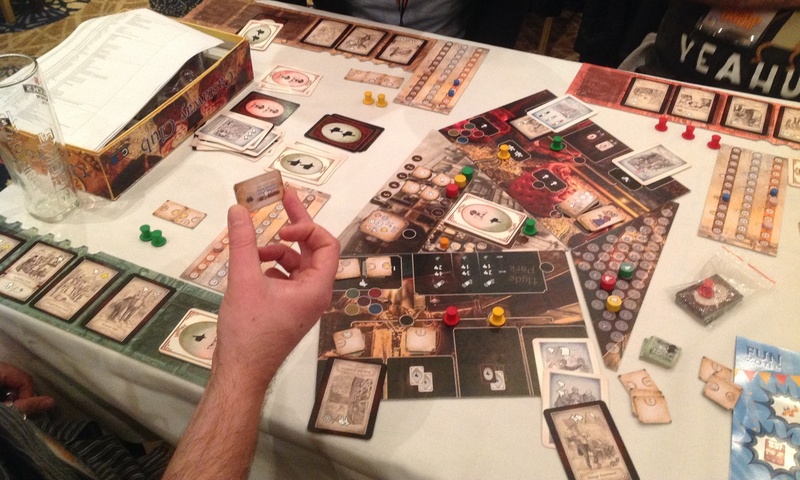 The name may change; some people have called the game ‘The Losers’, but it should be out at Essen. 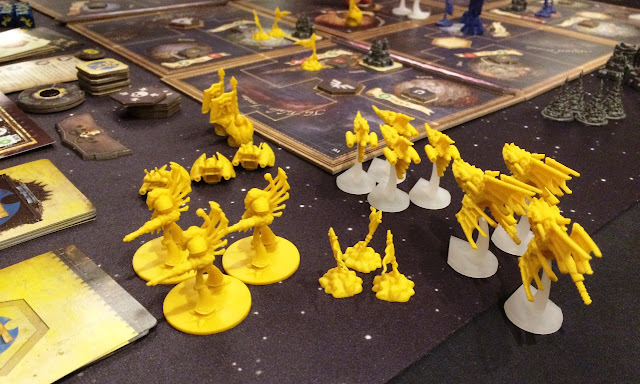 It might seem a bit odd, toting a game from a major US game publisher at a UK centric event, but visitors at the Expo got the chance to play an early demo copy of Warhammer 40,000 Forbidden Stars, and my word it looked pretty. I was secretly hoping that Forbidden Stars was going to be a disappointment; I wanted to convince myself that I could save the hefty £80 price tag, but the game received an overwhelmingly positive response from everyone who played it. 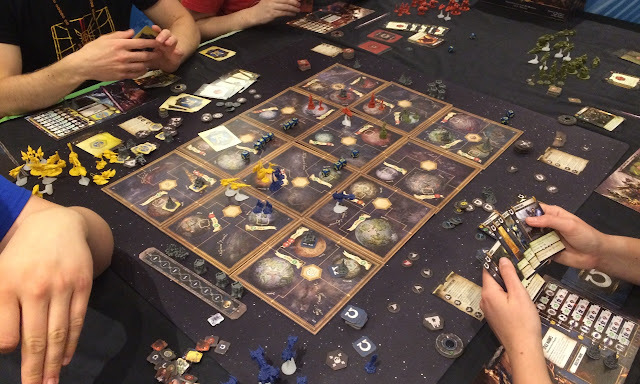 The game was surprisingly easy to play and not just a simple re-skin of the Starcraft Boardgame. 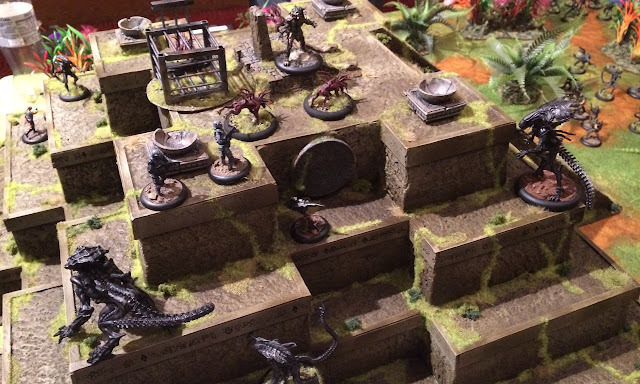 It was also devoid of the chunkiness that is often found in the larger Fantasy Flight games. 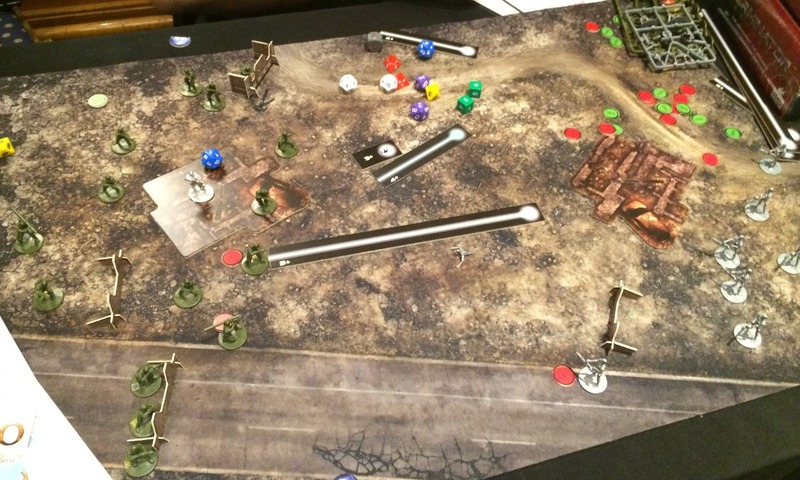 Warlord games and designer Alessio Cavatore where busy demoing their movie tie-in miniatures game Terminator Genysis. Everything about the game looked really good and the ability to scale the game up from a troop based skirmish game to full on vehicles sounds impressive. To me it’s not Terminator without Hunter Killers. The stand out miniature however, was Arnie. Yes you can play with the T-800 Model 101 himself and the miniature looked amazing. Take into account that this isn’t a resin or metal model but a hard plastic and you can really appreciate the level of detail. It’s been two years in the waiting but the Alien Vs Predator board game, that neatly expands into a full on Aliens tabletop miniatures game, was finally unveiled in all its glory. Only a few eager Kickstarter backers got their hands on the limited copies available and they could be seen stalking the Expo halls cradling the giant box like their first born. 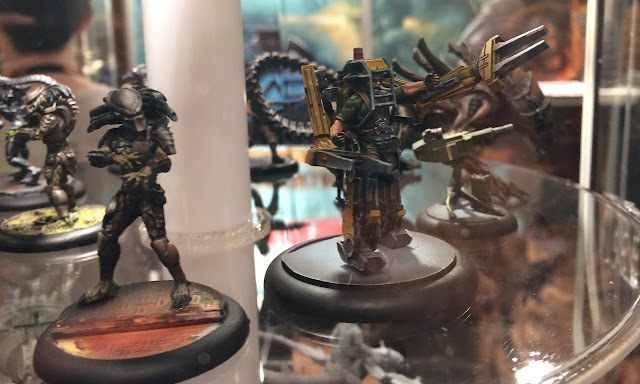 We got to take a good look at all the components and plenty of the expansion miniatures from bull Aliens to Power Loaders where available to drool over at the Prodos Games stand. 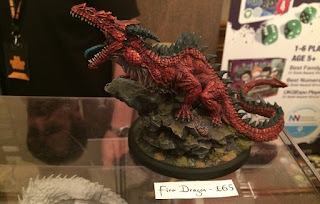 There were loads of miniature game companies on show at The UK Games Expo, miniature gaming is something we do very well here in the UK, but the one miniature that quite literally turned my head was the Undead Leviathan from Warplogue Miniatures. 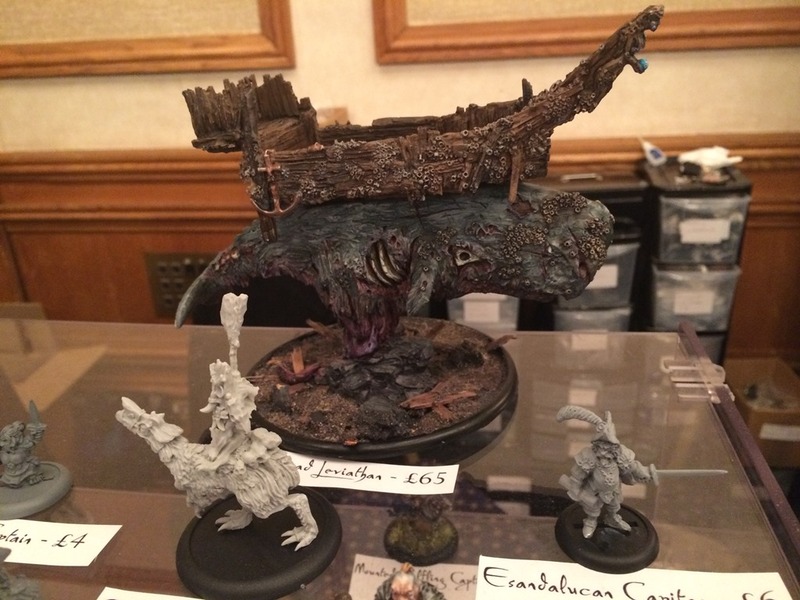 To put it simply, the miniature is a zombie sperm whale with a boat strapped to its back, need I say anymore. Warplogue were also showing off their miniatures for their Arcworlde skirmish game and you can check out more of the miniatures in our Facebook Gallery. 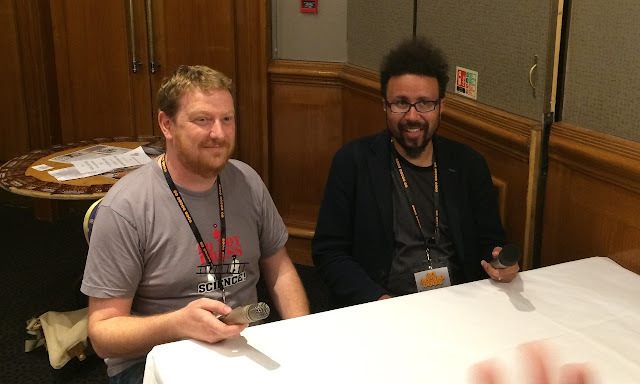 There were loads of great board game designer, publisher, bloggers and podcasters that I met, and interviewed, over the weekend. Each one was an absolute pleasure to speak to and it was inspiring to meet so many other gamers who are so passionate about this hobby. The highlight of all these fantastic people was meeting two of the biggest names in game design, Eric Lang and Ignacy Trzewiczek. Both where at absolute pleasure to talk to, and both and extremely accommodating to us pesky blogger types. The worst part of the Expo for me was simply time and timing. I had to miss out on Friday’s excitement and press event due to the wedding of two of my best friends (which was board game themed by the way). This meant that I’d already missed out on one third of the Expo experience. The other issue was we were a man down at The UK Gaming Media Network stand. This meant that Chris, Mike and I were practically tied to the stand all weekend. We managed to get loads of interviews recorded so keep an eye on the UKGMN youtube channel, but it meant that I didn’t get the opportunity to go round the expo and play anything. Yes that’s right folks, two days at the UK’s largest gaming convention and I didn’t play a single game. I would like to extend a massive thank you to everyone who made the experience at the Expo so great. From the other bloggers at the UK Gaming Media Network to the designers and publishers who got harassed by us, from the big games companies who brought along their best games to the volunteer staff who helped everything run so smoothly.